Eagle Rock was the place to be last Friday night for track and field lovers and their pastrami-craving spouses. While The Astronomer was stoked to see some of the nation’s best distance runners competing at Occidental College, I was excited for dinner beforehand at Chef Andre Guerrero’s The Oinkster. It was truly a win-win situation for all parties involved, a rarity that we recognized and relished. The Oinkster opened sometime in 2006 and the crowds haven’t let up since, especially with Guy Fieri joining the legion of fans. A line a dozen deep was snaking out the door when we arrived at half past six. The menu here is all-American with a “slow fast food” bent. 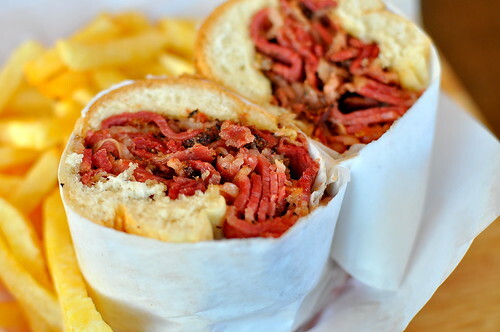 There are burgers, roasted pork, and rotisserie chicken to be had, but everyone seems to dig the pastrami most. Everything is reasonably priced under ten bucks. We snagged a seat by the window as soon as we placed our order at the counter. 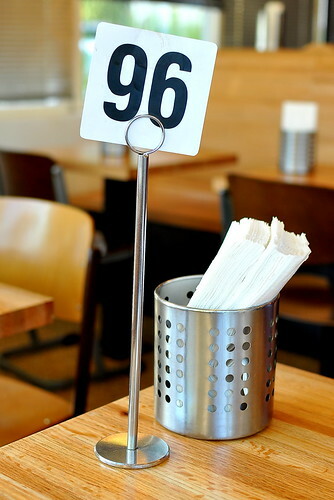 The stack of napkins atop the table came in handy later when things got finger lickin’ messy. 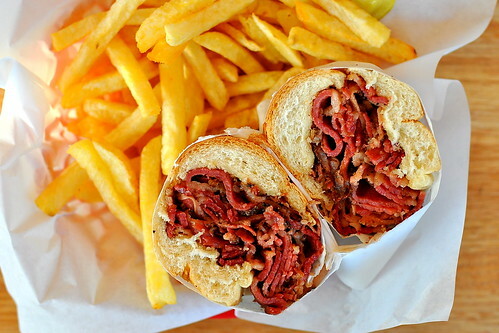 For The Astronomer, a house-cured pastrami sandwich ($8) with Belgian fries on the side. 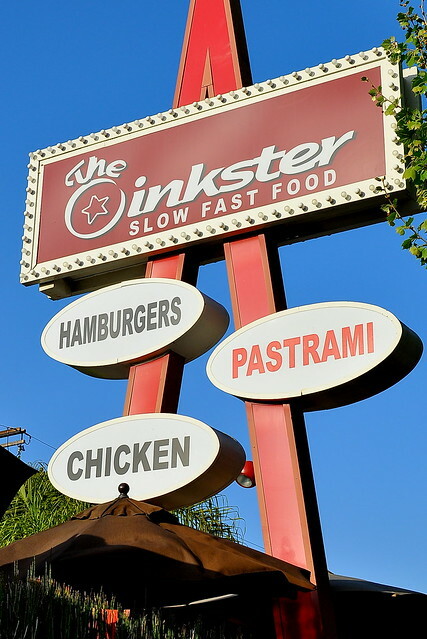 Chef Guerrero set out to create The Oinkster’s signature dish after learning the ropes from none other than Al Langer of Langer’s Delicatessen. Here, the pastrami is cured for two weeks, rubbed with a secret spice blend, and smoked with applewood. 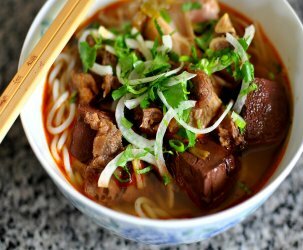 To serve, the meat was sliced thinly and piled generously onto a white roll. With a thick streak of fat running through every slice, the pastrami could’ve been mistaken for bacon, but the peppery flavors permeating throughout signaled that this baby was all pastrami. While the Belgian fries were too underdone for The Astronomer’s taste, I could not get enough of their crisp shells and fluffy innards. 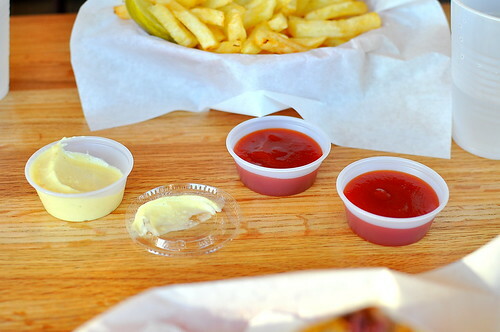 Best of all were the house-made sauces on hand for dipping. The plain and chipotle ketchups were both fabulous, but it was the container of garlicky aioli that was completely licked clean by the end of the meal. This stuff needs to be bottled and sold at fine retailers across the Southland. I ordered a Reuben sandwich ($8.50) with house-cured pastrami, Thousand Island dressing, sauerkraut, and gruyere cheese on rye bread. While the meat was wonderfully tender and smoky, the bread could barely handle its contents, which resulted in a deliciously messy battle between me and Reuben. Toasted in the oven the following day, the leftovers fared far better. 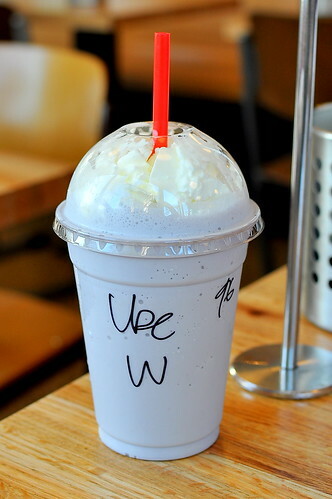 Salty sandwiches were made to be paired with thick and sweet milkshakes, so The Astronomer and I shared the ube shake with extra “whip” ($4.50). Made with Fosselman’s ube and coconut ice creams, it tasted like a Filipino dream. Thanks for the rec, Nastassia! We followed up our indulgent dinner with an evening of track and field at Oxy. That’s almost as good as actually going for a run, right? Love Oinkster! When you order a combo, sandwich + drink, you can switch out the drink for a root beer float! Cool, right? Who does that at no extra charge? 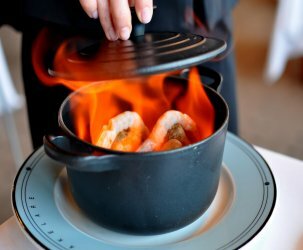 You should also try his other restaurant in Highland Park, Maximilliano’s. Watching people run can be equally as exhausting! The burning of calories might by slightly less, but you’re still losing them. Anna – The man who rang up our order saved us a buck by bundling the fries, pastrami sandwich, and milkshake into a combo. He mentioned some sort of milkshake supplement though. So awesome that a root beer float doesn’t incur a surcharge! Next time! Anthony – I was hoping you’d say that! I really love this spot & the people working there are always so friendly. That shake is making me weak in the knees. 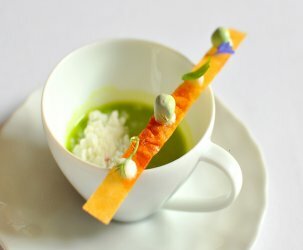 Love the food at this restaurant, but unfortunately prices have skyrocketed in a year’s time. E.g. the regular pastrami is up 19%. 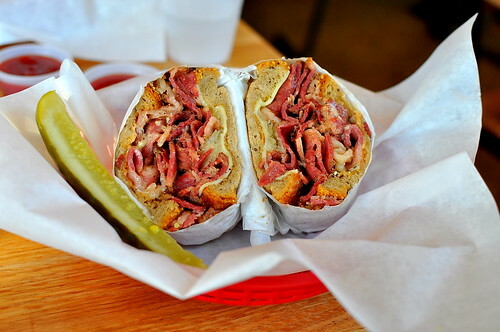 the Reuben is up 30%, and the shakes are up 45%. That’s a bit ridiculous for a year.